Japan's richest entrepreneur outlined a plan Monday to rebuild the country's energy infrastructure in the wake of its nuclear disaster, shifting the majority of supply to natural, renewable resources by 2030. Softbank CEO Masayoshi Son speaks at the launch of his energy foundation. 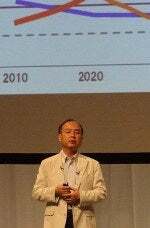 Masayoshi Son, founder and CEO of Softbank, spoke at the launch of his Japan Renewable Energy Foundation. He said Japan could shift to renewable energy sources for 60 percent of its electricity requirements over the next two decades, calling for a 2 trillion yen (US$26 billion) "super grid" across the country, and underwater off the coast, that would zip electricity around cheaply and efficiently to meet demand. "Japan is a country that is riddled by earthquakes," Son said at a conference hall in central Tokyo. "We must minimize our use of nuclear power over the next 20 years." The business icon spoke six months after an earthquake triggered a tsunami that ravaged a large portion of Japan's northeast coast, flattening towns and triggering meltdowns at a nuclear power plant that supplied much of Tokyo's electricity. The country's power companies are still struggling to meet demand, and the government has vowed to lessen dependance on nuclear plants, though Japan has few traditional energy resources of its own. He promised to invest in ventures that backed renewable energy and called for opening up the power industry to allow for more competition. More openness would lead to opportunities for new players like Son, who has made his fortune forcing his way into the formerly tightly run business realms of Internet providers and mobile operators. The business leader has already invested 1 billion yen of his personal money to create the foundation, and said Monday that Softbank would invest 10 to 20 billion yen in a new renewable energy business. Son said the 2,000 kilometer (1,200 mile) nationwide power grid he proposed could eventually be expanded to all of Asia, in a massive grid that would run 36,000 kilometers and link Japan with countries including India, China, and Russia. "By connecting Asian countries in this way, we could possibly create a more peaceful Asia overall," he said. Monday's event was the start of three days of presentations and panels by energy experts from Japan and abroad. Son, ranked as Japan's richest man by Forbes Magazine in March with a net worth of $8.1 billion, transformed a small software company into one of Japan's largest Internet conglomerates. The company operates the country's third largest mobile operator and exclusive purveyor of Apple's iPhone and iPad, owns domestic Internet properties such as Yahoo Japan, and has invested heavily in online businesses abroad . He has taken high-stakes gambles to break into new industries in the past, including the purchase of Vodafone's floundering Japan mobile business in 2006 for around $15 billion, most of which was borrowed. But he said that profit was not his main motivation for his energy investments, saying he mainly wanted to provide an example for other entrepreneurs in traditionally risk-adverse Japan.